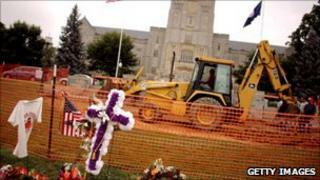 The US government has fined Virginia Tech university $55,000 (£34,413) for failing promptly to warn students at the start of a 2007 shooting massacre. The education department said the school broke federal law when it waited two hours after the first killings to warn students of a gunman on campus. The university in Blacksburg, Virginia, said it would appeal against the fine. In April 2007, 32 were killed when a student went on a two-and-a-half-hour rampage before killing himself. "Because Virginia Tech failed to notify its students and staff of the initial shootings on a timely basis, thousands continued to travel on campus, without warning," the department wrote in a letter announcing the fine. "Had an appropriate timely warning been sent earlier to the campus community, more individuals could have acted on the information and made decisions about their own safety." On the morning of the massacre, Cho Seung-hui, 23, shot and killed two students in a dormitory. He fled, leaving a trail of bloody footprints, clues that Department of Education investigators said indicated the gunman was still at large and posed a danger. According to investigators, school administrators waited two hours and 15 minutes before issuing a vague warning that a shooting had occurred on campus - after students had already left for morning classes. Fourteen minutes after university officials sent out that notice, Cho began attacking students and faculty in a nearby classroom building, eventually shooting 47 more before taking his own life. Department officials levied the maximum fine permitted but said the university's violations warranted a far greater penalty. A university spokesman said administrators had responded "appropriately" based on the information available at the time.